John and I reunited after 25 years and 2000 miles apart. The man who stepped off the airplane at Portland PDX in August 2015 was 50 pounds heavier than the last time I saw him. He was also a Type 2 diabetic giving himself four insulin shots a day. Luckily, I watch food documentaries for fun – the kind that claim diet and exercise can reverse chronic illnesses, like Type 2 diabetes. 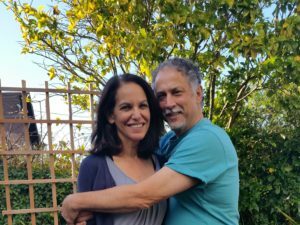 During our almost two-year, long-distance courtship, John attempted to lose weight and reduce his blood sugar levels on his own with minimal success. 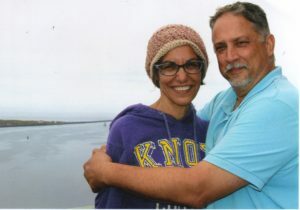 He didn’t get serious until he moved from Michigan to Oregon to create a life with me. John sent me a Ted Talk featuring Dr. Sarah Hallberg explaining how a high fat, no sugar, low carb food plan can reverse diabetes. My bias was towards vegetarian, low protein options, but John wanted to give this plan a shot. My research led to reviews of Reverse Your Diabetes Diet by Dr. David Craven with many readers claiming to have lowered their blood sugar levels in just a few weeks. We decided to try it. Success with any food plan requires making the right foods easy to access. John works out of our home so I cook on the weekends to make sure the fridge is stocked with homemade soups, salad fixings, almond flour pancakes, fruit and proteins like nuts, legumes, eggs, meat and fish – mostly organic and ready to eat. We don’t purchase anything with more than a few grams of natural sugar. Occasionally, we eat fresh whipped cream on fruit, spiked with vanilla and cinnamon instead of sugar, as well as high fat foods like bacon and cheese. These foods help him feel full and minimize cravings for sugar and carbs, which are reserved for special occasions. For example, he enjoyed a single serving cake from a local baker on his birthday (no second helpings). John also resumed regular exercise, including pickleball, hiking, lifting weights and gardening. He took his baseline weight and continued to monitor his blood sugar every morning and two hours after each meal. He reduced his insulin shots to every other evening so he could truly gauge the effects of his new lifestyle. Almost immediately, John’s blood sugar levels began to drop into a normal range. After a month, he discontinued the insulin completely and his blood sugar remained normal. In just three months, he lost 30 pounds and says he rarely feels hungry nor craves carbs and sweets. John still has diabetes but he’s controlling it with lifestyle. If he goes back to his old ways, his blood sugar levels will rise. This is working because John is motivated and I'm in it with him. We both have a lot to lose. Do you have a lifestyle change success story? I’d love to hear it. Great news for both of you. Recognizing carb and sugar cravings get in my way of peace energy and cause emotional roller coasters. That’s such a marvelous success story. Determined & the power of a good partner to help in every aspect truly made this goal a reality! So hapoy for John & you! March of this year my 12 year old son blood sugar level came back above the normal level. He was prediabetic and I was so upset. Diabetes runs in my husband family and I have seen the effects of it first hand. I put him on the same diet that you used and the results have been amazing. His blood sugar is back in the normal range. He also has lost 42 pounds. He has been amazing and understands what he can and cannot eat. He understands that he will have to eat this way for the rest of his life. This diet really does work to reverse diabetes. That is wonderful news. Congratulations to you and your son!